Over the years I’ve witnessed the health and fitness industry go through many trends; most of these trends have focused on one thing – weight loss, instead of exercise to balance your body. Often exercise is used to ‘burn’ away unwanted calories – sometimes through punishing behaviours such as brutal exercise regimes and restrictive nutrition. Whilst these behaviours can be an easier, albeit short-term, route to weight loss, they are not addressing the habits that cause imbalance in the first place. Every choice you make has consequences and that also holds true in the type of exercise you choose. Making the wrong exercise choice can quite often lead to injury, pain and frustration. Making a healthy choice is about being aware, honest, taking responsibility, and not ignoring what your body is trying to tell you. By definition ‘working out’ means to expend energy, which is fine if you’re well rested, have eaten nutritious food, and stress levels are low – but when they’re not – working out can be merely flogging a tired horse! If you feel fatigued, overly stressed or suffer from aches and pains then your best choice for exercise are those that allow you to ‘work-in’. Working-in stimulates recovery and digestion whereas working out stimulates the ‘fight and flight’ side of our nervous system. Work-in exercise is usually performed mindfully and aligned with breathing. The slower movements combined with breathing create energy or ‘Chi’ this, for example, this is why walking after a large meal can energise you and aid digestion. Should I work out then? Of course working out is a healthy thing to do; it improves our functionality to move and overall fitness levels. However, we need to be mindful that our stress levels are low enough for our bodies to be able to repair and adapt from the stress of working out. On a daily basis you need to be asking yourself, “have I slept and eaten well?” “How much energy do I have?” ”What’s my stress level been?” The answers to these questions should dictate which kind of exercise choice you make. Have you ever lost weight when you’ve been away on holiday and done nothing? If you have, this is a sure sign that your body is thanking you for relaxing and taking the load off! In a nutshell, working-in is akin to charging your battery and working-out drains your battery. This is why it’s important to work-in before you work-out. Work-in exercises are anything from stretching, yoga, walking, simple breathing techniques and Tai Chi and QiGong. Tai Chi and QiGong are perfect at building/balancing energy, clearing the mind and aiding grounding. Tai Chi is an ancient Chinese martial art renowned for its health benefits, which aim to increase your energy levels by relaxing the body and aligning your Chi with nature’s energy. 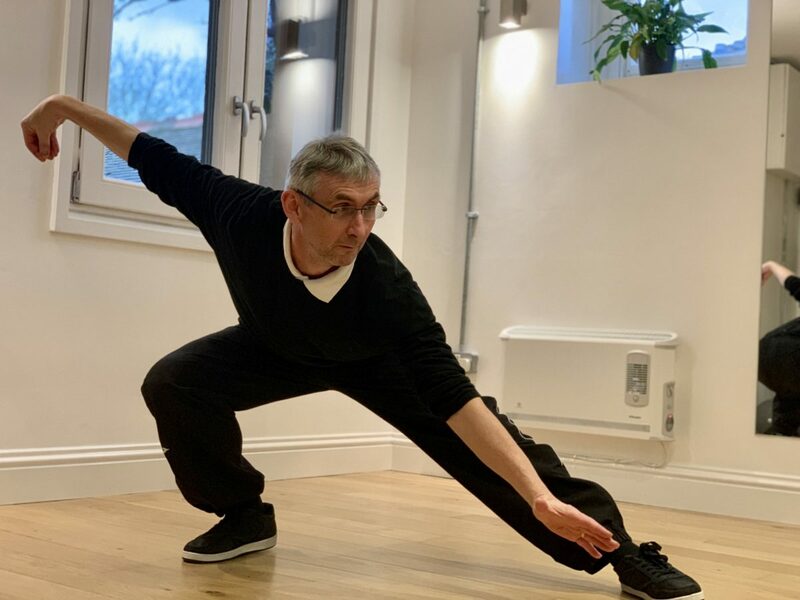 We are lucky enough to have Chris Mowen start a beginners’ Tai Chi class on Wednesdays from 1.45- 2.45pm at HealthTribe’s studio in Shoreham. Chris is a registered advanced instructor with the Tai Chi Union of Great Britain and has been teaching for 15 years. Classes are restricted to 6 people, so if you’d like to recharge your battery get in touch here! One of the greatest enjoyments of Tai Chi is wonderful relaxation. The mind finds the ability to still itself and this stillness reflects into the conscious level of the mind, which then reflects into the physical body. Concentration of mental energies allows for greater focus. Each time you perform Tai Chi you draw powerful, healing life supporting energies to heal you mentally, physically and emotionally. Heart and circulatory system. Tai Chi is a gently powerful exercise for the heart, without any excessive strain. Tai Chi lowers the heart rate, increasing blood flow and the diameter of blood vessels. Studies have shown that people who practise Tai Chi are less likely to have high blood pressure. Respiratory system. Diaphragmatic breathing increases the function of the lungs and helps to oxygenate the blood whilst removing toxins from the body. Muscular system. The gentle movements of Tai Chi allow the muscles to work gently without undue strain. Skeletal system. The joints are aligned properly which helps aid their free action and together with the improvements in the muscular system, posture is improved considerably. Digestive system. Diaphragmatic breathing and the movements of the waist during the Tai Chi movements help to massage the digestive system, which in turn helps the digestive system to work with greater efficiency. Stability. Tai Chi provides an ideal mix of joint strengthening with gentle twisting and turning which is very effective in helping prevent falls, particularly in older people. Arthritis. The benefits of Tai Chi for arthritis sufferers have long been recognised. Through gentle exercise, and by stimulating circulation, Tai Chi drives stiffness from the joints. Calories. Designed as a complete workout for your muscles, joints, ligaments and internal organs, Tai Chi is a low impact style of exercise, which burns calories. Think of movement and exercise as a toolbox, and remember to use the right tool for the right job to balance the body!